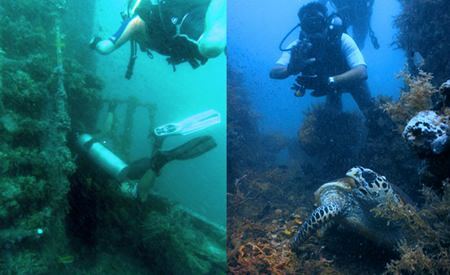 Pattaya is a diving paradise for both experienced and non-experienced divers. “Koh Khrok” is the nearest diving place where you can see breath-taking coral reefs at a depth of 3–12 m. The current is suitable for drift diving. You may see sea turtles as well. The “Pattaya Vessel” is the point where you can observe the ancient vessel at a depth of 26 m near “Phra Nang Rocks”. The vessel is covered with hump corals, disc corals, mushroom corals, staghorn corals, sponges and sea fans. “Koh Larn” is also another diving area where rare marine animals and beautiful sea slugs can be seen at a depth of 6-20 m. The current is not so swift. 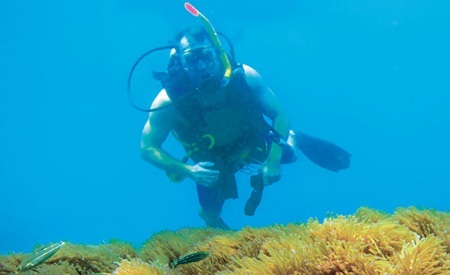 Diving also can be made at “Koh Phai” where you can see beautiful fish, or you can go through the past by diving at the “HTMS Khram Wreck”, a World War II vessel which was sunk at a depth of 30 m. This vessel is the first man-made diving spot in Thailand. 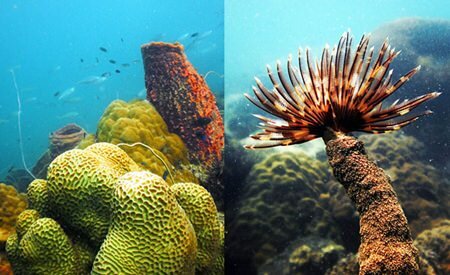 Not far away, the corals and Neptune’s cup sponges are very abundant at “Koh Mara Wichai”. The sea water here is very clear. 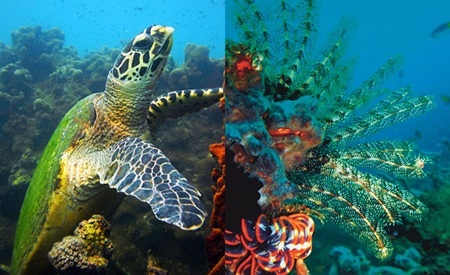 Various marine animals – red soldierfish, bluering angelfish, regal angelfish, longnose butterfly fish and pennant butterfly fish – can be seen at a depth of 5 – 20 m.
The most faraway diving spot is at “Koh Rin” where coral reefs and rare marine animals can be observed. For example, hump corals, staghorn corals, table corals, mushroom corals, black corals, sea whips, colorful soft corals, sea fans, Neptune’s cup sponges, blue sponges, nudibranch, xeno crabs, sawblade shrimp, rabbit fish, squirrel fish, barracuda, and sea turtles. The HTMS Khram Wreck dive site requires Advanced Open Water Diver certification. Recommendation: Stay over on Koh Larn for at least 1 night. Travel Info: Take a boat from Bali Hai pier in South Pattaya. Boats leave daily every hour. However, all diving packages usually include sea transfers. Facilities & Services: Boat, diving gear, dive leader and food.